Details are beginning to emerge of how waste collections will work in East Sussex after the contract with outsourcing provider Kier comes to an early end next year. Earlier this week, two of the four councils in the East Sussex Joint Waste Partnership – Rother District Council and Hastings Borough Council – met in private to discuss plans for appointing a new contractor to take over in June 2019. 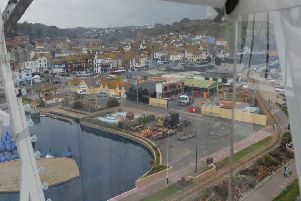 While Rother discussed the full item in private, Hastings councillors discussed part of the plans publically, with the confidential aspects of the proposals being debated separately. During the meeting councillors revealed how the new contract will cost the authority more than the current arrangements and will see changes to how waste is collected from East Sussex residents. Conservative group leader, Cllr Rob Lee said: “It is worth underlining again that there are something in the region of 35,000 homes here, so the scale of the contract and this piece of work is huge. “Without talking about numbers it is worth saying and I don’t think I’m breaking any taboos here when I say that the cost of this contract is more than the one it is replacing. Councillors also discussed plans to bring in changes to how waste is collected, most significantly plans to mix glass in with general waste collections. Officers said this glass would still be recycled despite being mixed with other waste. Councillors also discussed how one of the partnership’s current members – Eastbourne Borough Council – will be going it alone instead of joining a new contract. Commenting on these plans, an Eastbourne spokesman said: “Eastbourne Borough Council made the decision to move to a Local Authority Controlled Company (LACC) in July 2017. “Alongside the local advantages of a service being run by the council for the benefit of Eastbourne residents, a LACC is a cost effective model of operation. “South East Environmental Services Limited, the name of the new company, will carry out waste and recycling collection and street cleansing in Eastbourne from July 1st 2019. Hastings Borough Council is also seeking to run part of its services separately and is in the process of setting up an in-house street cleansing service, which would stand apart from the Joint Waste Partnership. Discussing these plans, council leader Peter Chowney said: “This is kind of the biggest thing we do really; waste, recycling and street cleansing. It is by far for any district council the biggest item of expenditure, so it is worth spending a little bit of time on it to ensure we are doing the right thing. “We decided to split it this time and go for an in-house service for street cleansing and contract out the refuse collection. I’ll be honest, I would have liked us to have been able to bring them both in-house but I think there simply wasn’t the capacity to do that. Cllr Chowney added that he was confident that the town’s street cleansing service would be improved by being brought in-house, saying staff would be easier to contact and would be more responsive to reports of waste. He also said the bin collection service ‘was never bad anyway’ within Hastings, although he acknowledged that there had been problems in other parts of East Sussex. Following the discussion cabinet members unanimously agreed to recommend the details of the Joint Waste Contract to full council, who will have the final say at a meeting on December 19. A spokesman for Rother District Council confirmed its cabinet had also recommended the arrangements during its meeting. Wealden District Council meanwhile is set to discuss the plans at a meeting next Wednesday. A Rother District Council spokesman said: “The East Sussex Joint Waste and Recycling Partnership has completed its evaluation of the tenders received and is now securing the approvals needed to award the contract. “The final step in the process is a regulatory standstill period which allows the companies that have been involved in the procurement to scrutinise the outcome. While the full cost of the contract remains confidential, council documents show Hastings is expected to pay at least £55,215 per year as its share of the centralised administration costs. Wealden District Council and Rother District are both expected to pay a larger share of these costs to reflect Hastings bringing its street cleansing service in house. The overall costs of the contract, however, are expected to be far higher. The latest news comes amid reports of a fall in the Kier Group’s share prices, after it revealed an ‘emergency plan’ to cut its debts.